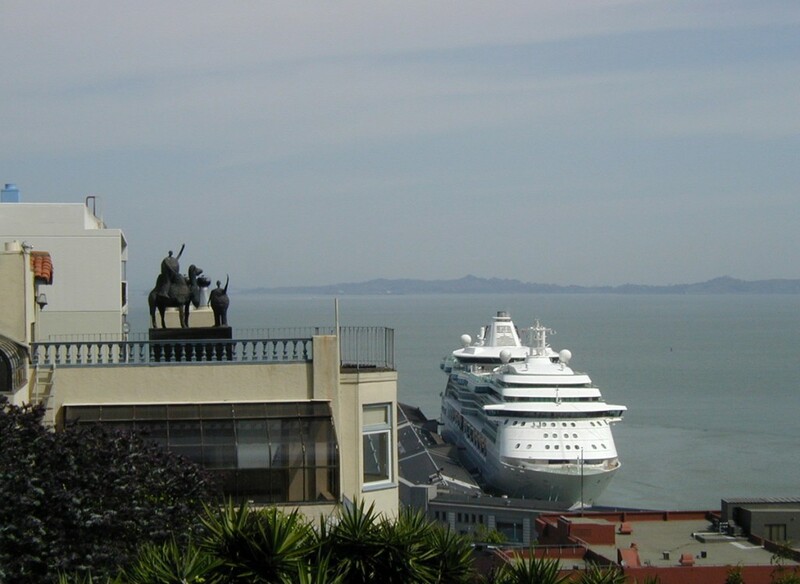 San Francisco was the first port of call on the very first cruise Janis and I ever took, a repositioning cruise from San Diego to Vancouver. We had driven through San Francisco before, taking one of the highways over the Golden Gate on our first trip to California together. But we never actually stopped to take in the city. This was our first time seeing some of its famous venues. The city is famous for a number of tourist attractions and we had no idea which we would see on our stay. 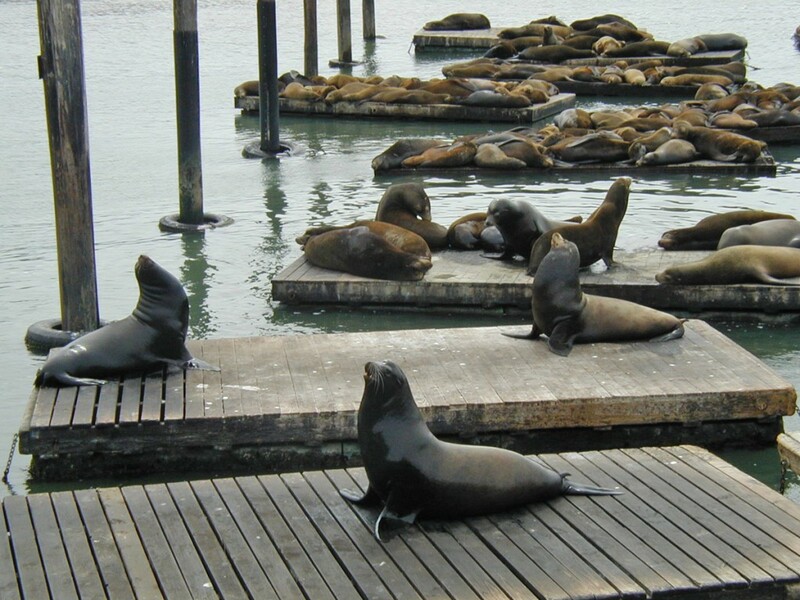 We were surprised to find that many of them were within walking distance of the cruise ship’s pier. In fact, the pier was only about four and a half miles from the Golden Gate Bridge. 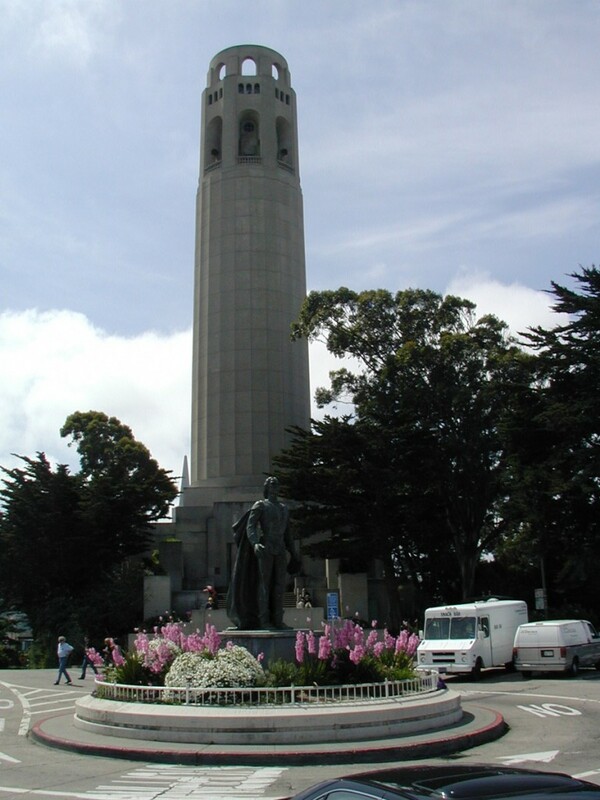 The closest landmark to our ship was Coit Tower on Telegraph Hill. 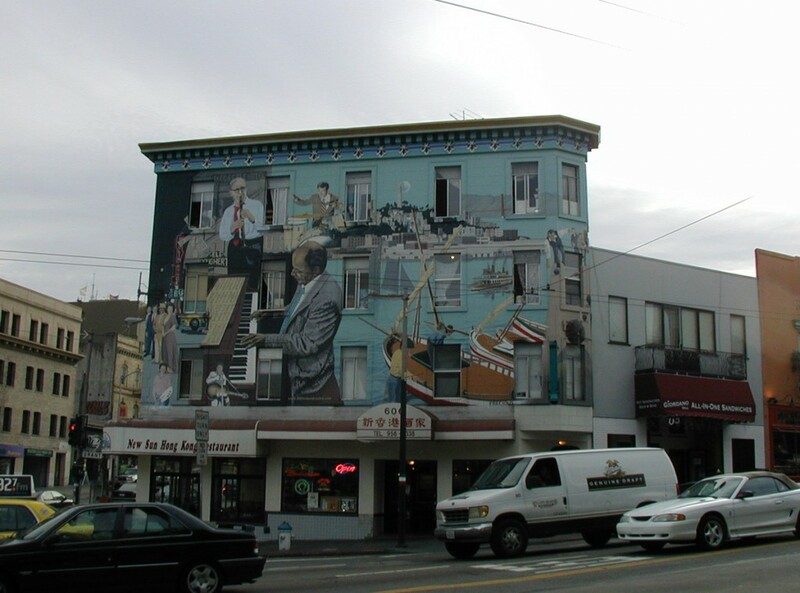 The tower was named after Lillie Hitchcock Coit, an eccentric woman who smoked cigars, wore pants and loved to frequent San Francisco’s gambling halls. She helped a short-handed fire crew on her way from school when she was fifteen and was made an honorary mascot of Knickerbocker Engine Co. No. 5. 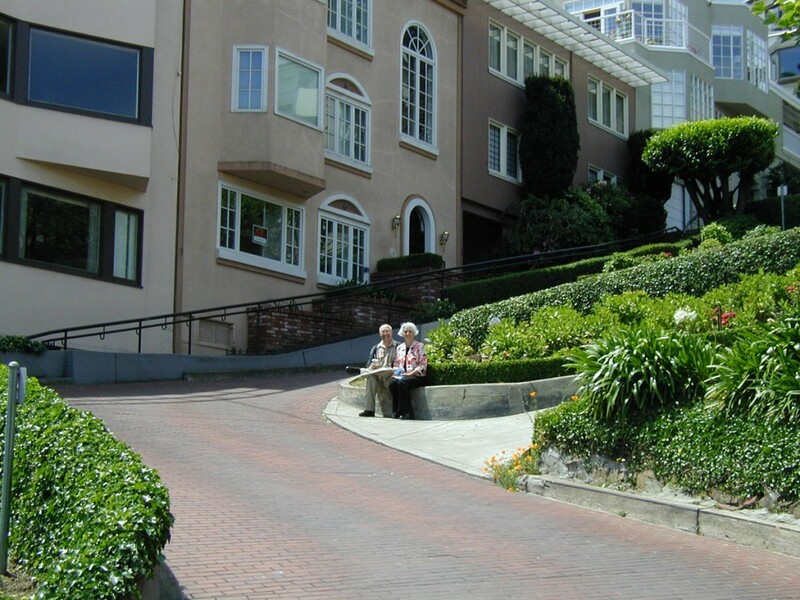 When she passed away she left a third of her ample estate to the city she loved and the city built Coit Tower in her honour. The 210 foot tower was built in 1933. An apocryphal story says the art deco tower is shaped like the nozzle of a fireman’s hose because of Coit’s fondness for firefighters, but the resemblance is actually coincidental. We climbed to the top where you get an excellent view of the city. 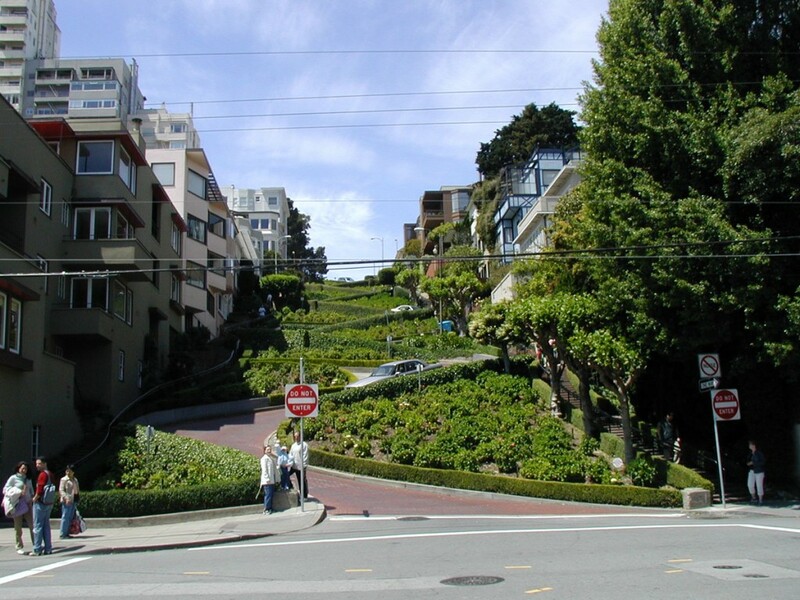 One of the sites we could see, even from the garden by the parking lot, was the famous zig-zag street, a short section of Lombard Street which has been used in movie chase scenes, notably The Love Bug (1968) and What’s Up Doc? (1972). The clip below has Herbie racing down the zig-zag street early in the scene. It looked to be walking distance so we hoofed it. It is only a mile away, about a twenty minute walk. And it is worth seeing, a fascinating piece of history. 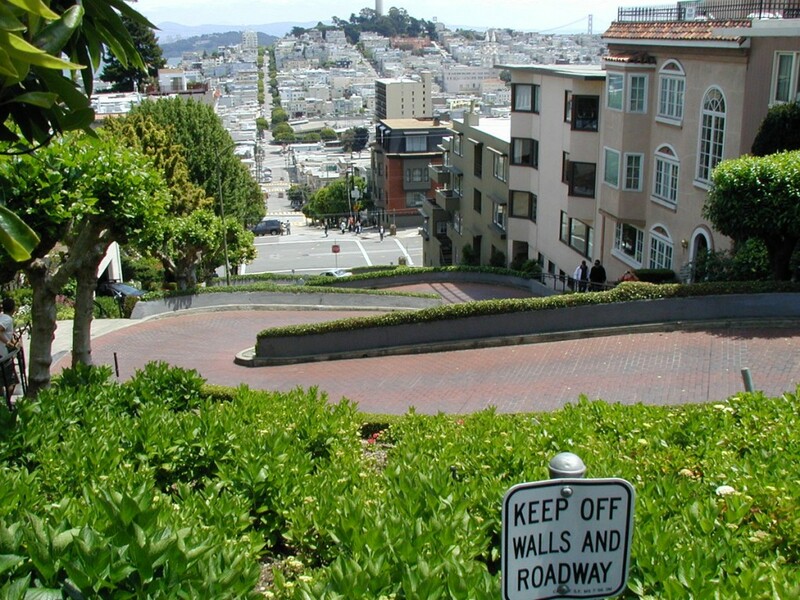 The zig-zaggy part is only a block long and has eight switchbacks traversing to navigate the 27 degree slope. A block further we came to Hyde Street where some of the famous cable cars ply up and down the hills. Naturally we had to take a ride. We went up the hill and soon found ourselves at another interesting venue, the power house. 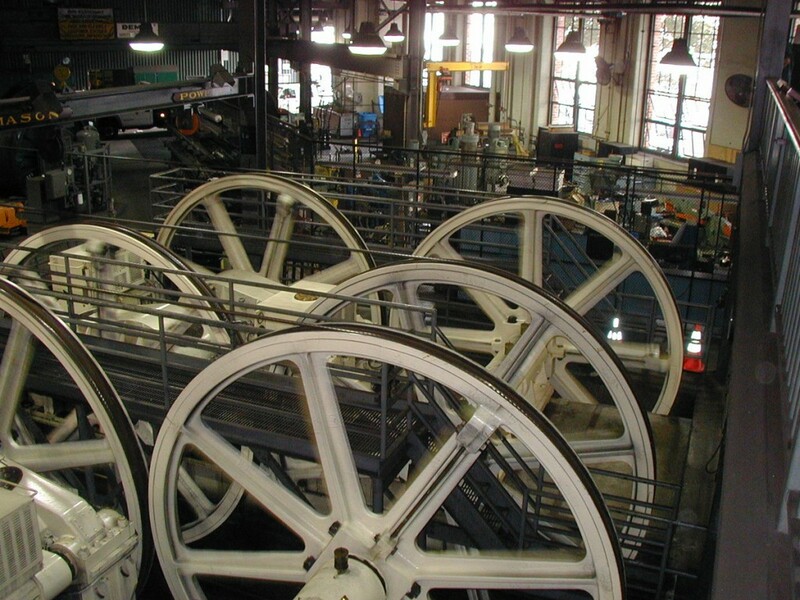 Here you can learn about the history of the cable cars and see the huge wheels that move the cables in action. 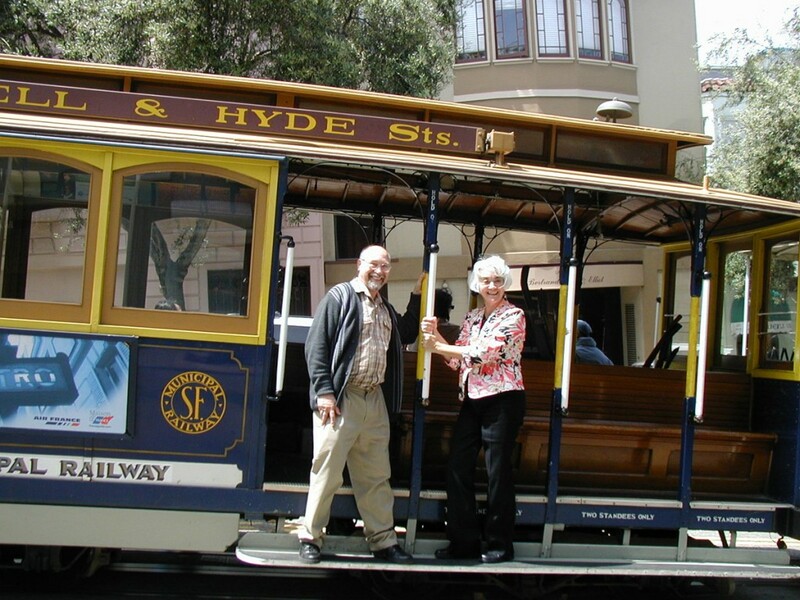 We took a cable car back down the hill to Fisherman’s Wharf. We cjecked out the famous Ghirdelli Chocolate Factory at the west end of the strip and then headed east. We stopped for lunch at one of the many restaurants along the way. 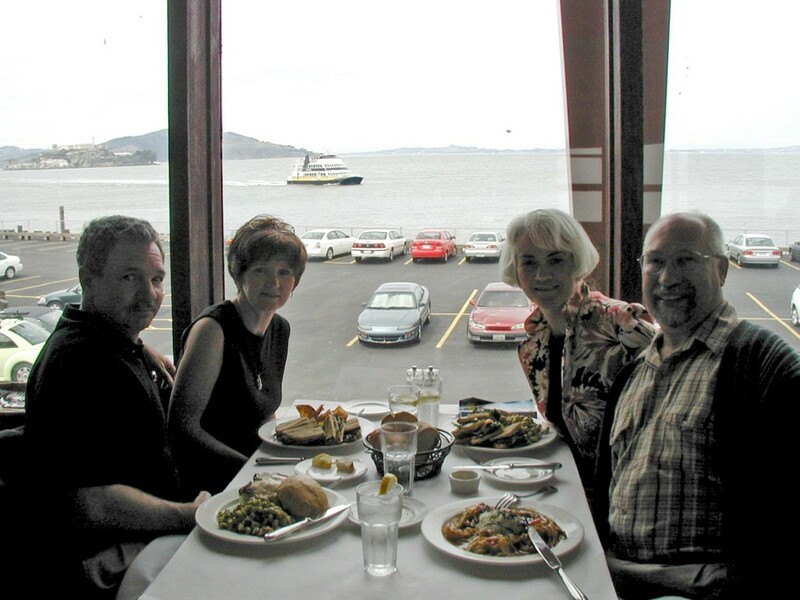 Many of the restaurants along Fisherman’s Wharf command an excellent view of the bay. That’s Alcatraz in the left background. After lunch we walked along the road taking in the sights when all of a sudden a piece of shrubbery jumped up and roared at me as I approached. I jumped about two feet in the air and my wife and friends had a good laugh. 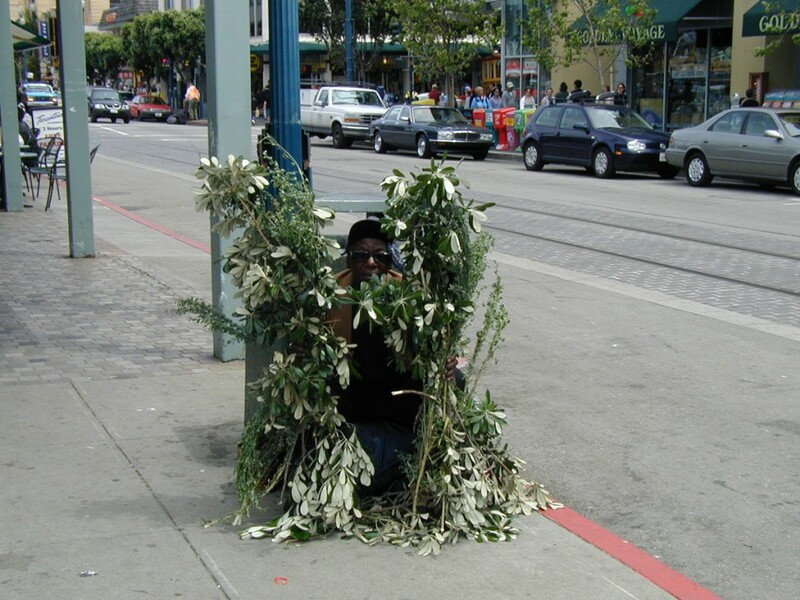 The shrubbery was the world famous Bushman. Some humourless local businesses have tried to shut him down and the city has occasionally charged him with a misdemeanour (he always gets acquitted by a jury). We thought he was a hoot. We crossed the street to watch unobtrusively as he startled a few more tourists. A good laugh. 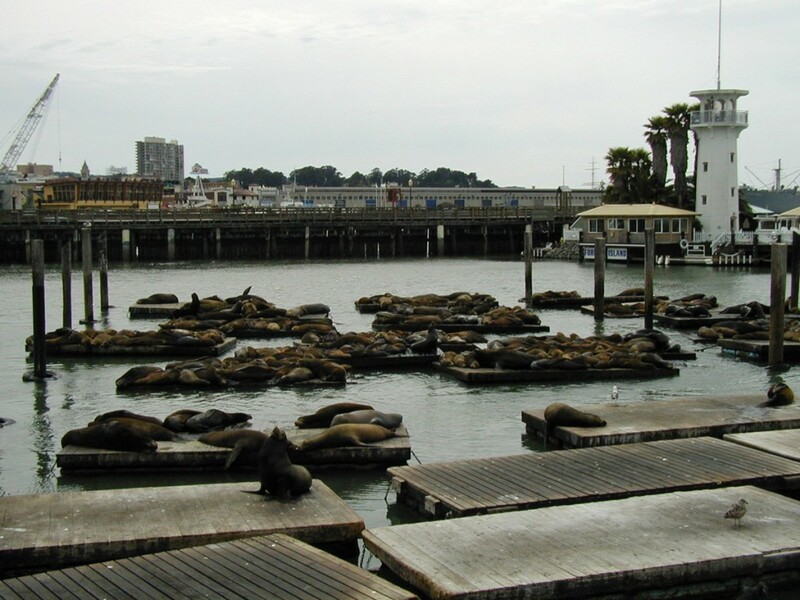 Further along we cam to Pier 39 where a lot of large floating platforms are home to a herd of sea lions. 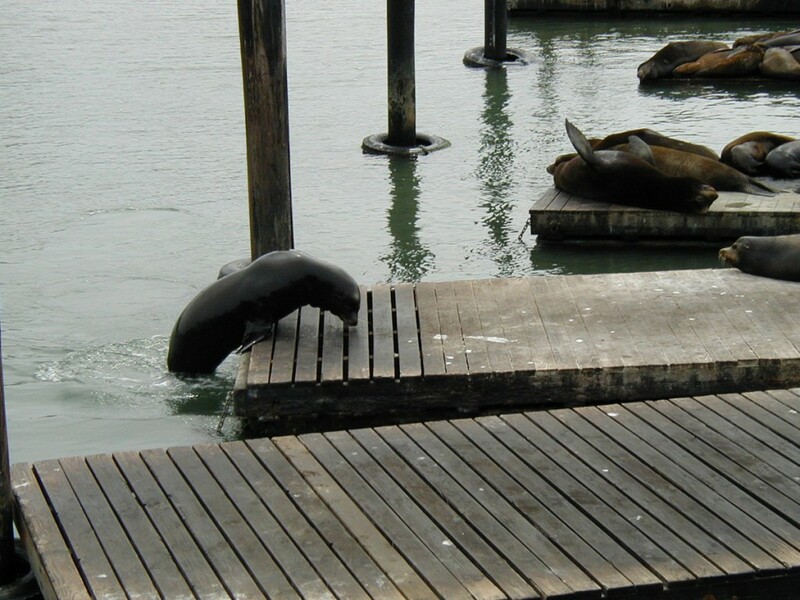 Noisy, smelly sea lions! Entertaining to watch. 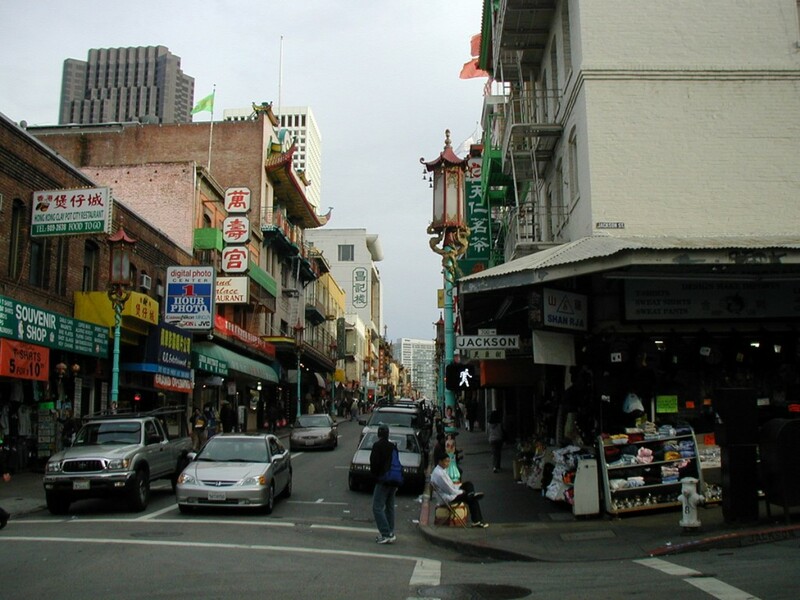 After Fisherman’s Wharf we still had lots of time before our ship departed so we hoofed it to Chinatown which is just over a mile from there, a 25 minute walk. 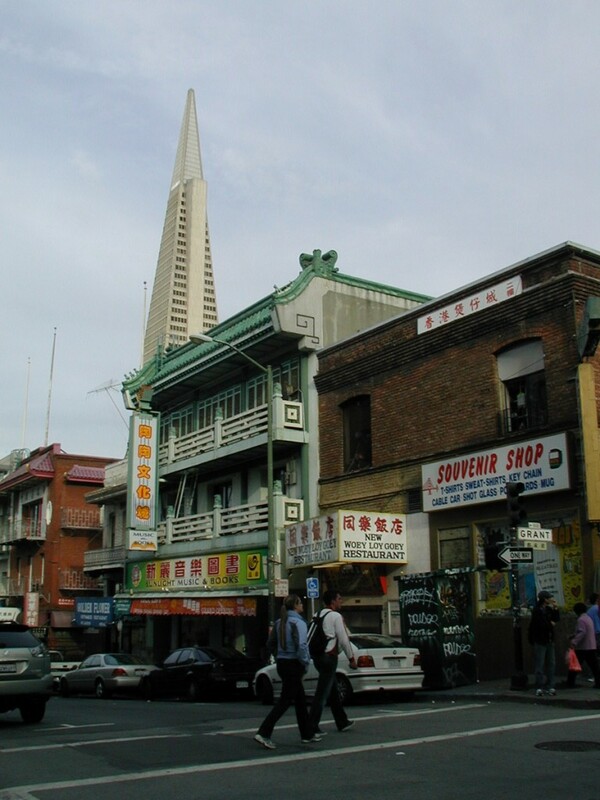 The old buildings of Chinatown are a sharp contrast to the soaring towers of the nearby Financial District. 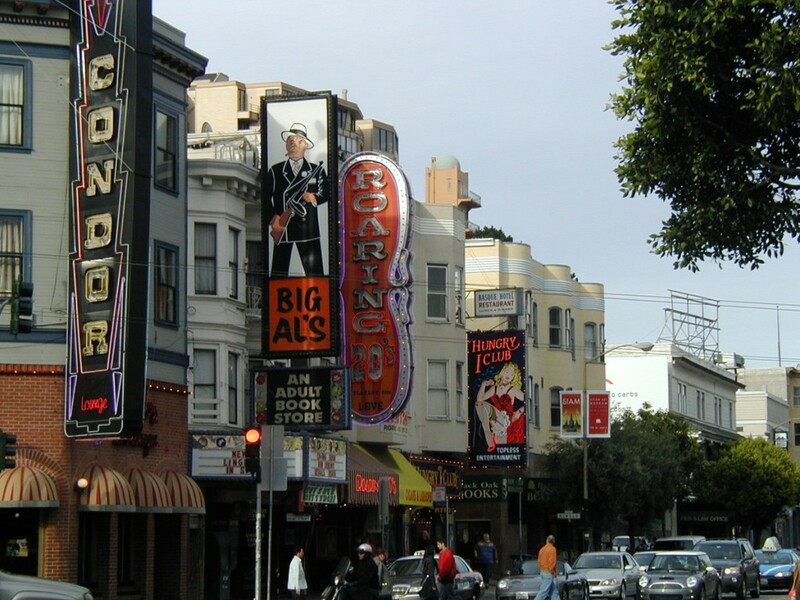 And we passed an area on Broadway that looked to be San Francisco’s sin city strip – adult book stores, strip bars, etc. featuring colorful names like Big Al’s, the Roaring 20s and the Hungry I Club. We made it back to the ship for our late sailing and caught the vibrant evening skyline as we left. All in all, a fun time in San Francisco. 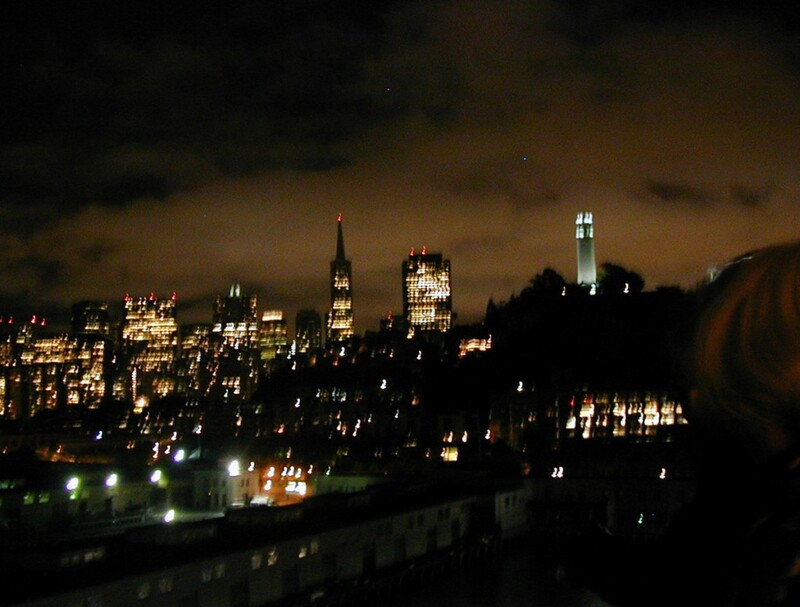 San Francisco at night from our cruise ship. 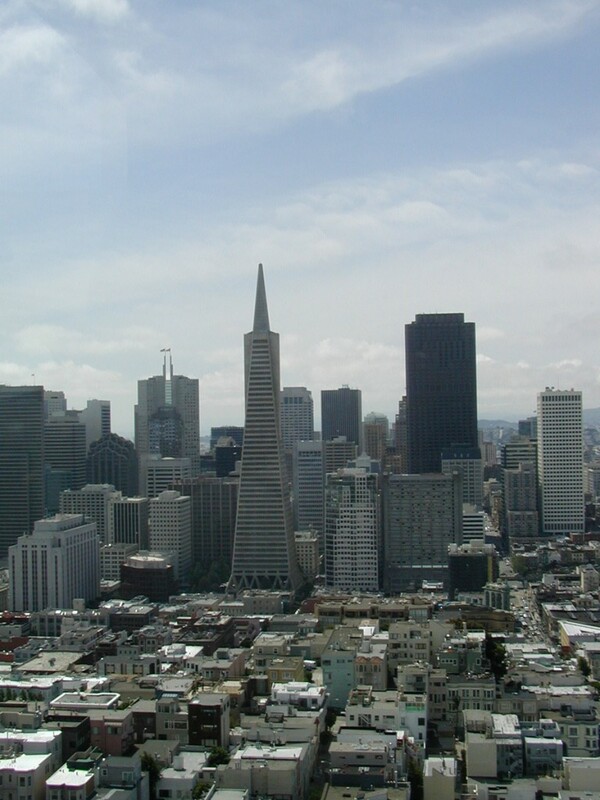 The Coit Tower and the Transamerica Building are prominent landmarks. Here are a few more photos of our visit. 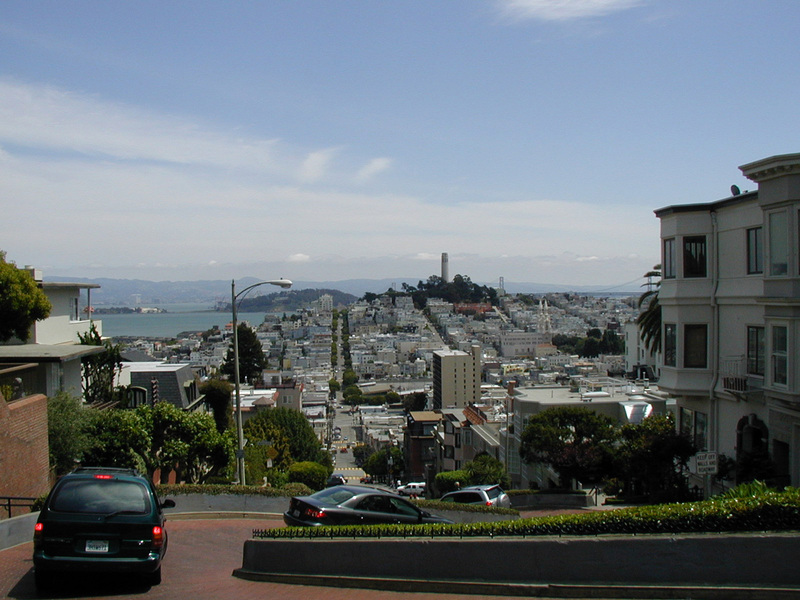 At the top of the zig-zag block, Coit Tower in the distance. The bridge in the distance is the San Francisco-Oakland Bay Bridge. 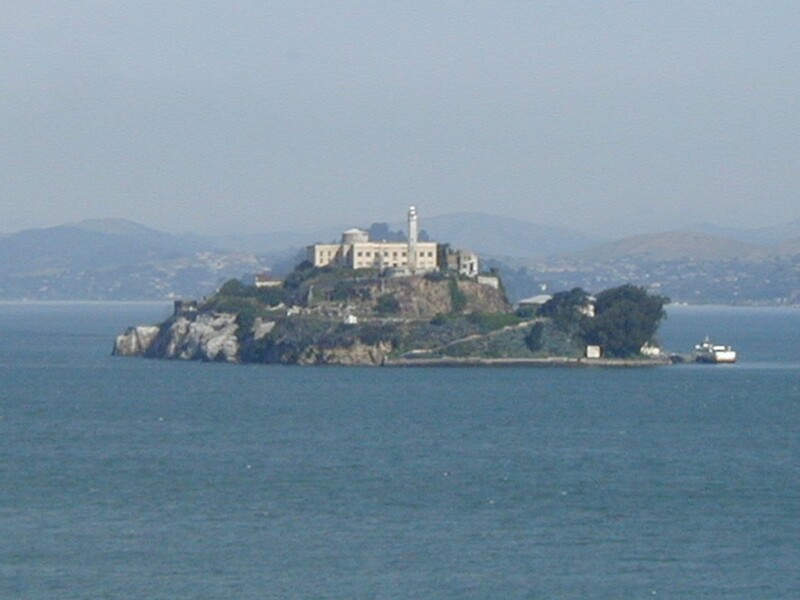 Alcatraz, once a notorious prison, now a major tourist attraction. We did not see it on this trip. Maybe next time.